The company said it was trying to "protect consumers from exceeding mobile data caps," according to the Wall Street Journal. AT&T and Verizon wireless customers are still limited to streaming Netflix at 600 kilobits per second, which reduces video quality in the process. Sprint and T-Mobile have gone unthrottled because "historically those two companies have had more consumer-friendly policies," Netflix asserted, referring to the fact that those carriers have typically slowed users down to 2G speeds when they exceed data caps, rather than threatening overage fees. Sprint, however, was throttling nearly all video until it was pressured to stop last year, and T-Mobile is marketing "Binge On," a controversial program which lets customers watch unlimited video from select services, but only at DVD quality (480p). Streaming two hours of Netflix video at HD quality could consume up to 6 gigabytes of bandwidth, easily blowing past many of the data caps imposed by U.S. carriers. 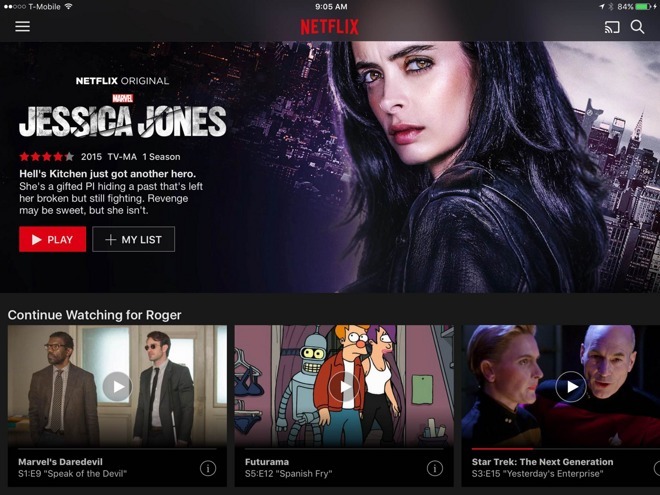 Netflix said that in May, it will be debuting a mobile "data saver" giving people the ability to favor bandwidth or quality on their own. The issue came to the fore last week when T-Mobile CEO John Legere noted that AT&T and Verizon subscribers were getting lower-quality video. The latter carriers denied doing any throttling. AT&T's senior executive VP of external and legislative affairs, Jim Cicconi, claimed the carrier was "outraged" to learn Netflix was throttling its customers without their consent. Netflix has been a vocal proponent of net neutrality rules, particularly since losing those protections could impede traffic for customers or force it to pay extra to Internet service providers. Its own throttling of customers is not technically a violation of FCC policy, however, since it isn't an ISP.